You are here: Home > Poll Of The Day: Will You Buy An iPhone On T-Mobile? Poll Of The Day: Will You Buy An iPhone On T-Mobile? After years of waiting, the iPhone looks to be all but a sure thing for T-Mobile sometime early next year. While T-Mobile nor Apple have confirmed which “Apple Products” will arrive on Magenta store shelves, T-Mobile’s CEO John Legere hinted at the worlds most “iconic device” landing soon. Which leads to our question and today’s poll is…will you buy an iPhone on T-Mobile? Now please, let’s not make this poll a “which OS is better” fanboy war, that’s not my intent. The real question is whether or not T-Mobile’s CEO is right or on the right track in his hope that the iPhone will help stop or lower the company’s churn in 2013. There’s no doubt some of you will stay loyal to your OS of choice, but for others the introduction of the iPhone is the last remaining holdout on T-Mobile and now provides the company with the same bevy of options as their competition. Choice is good, no matter what your preference is. So, in a perfect world, let’s just say the iPhone 5 launches on T-Mobile in March of next year, will you buy it? Will you buy an iPhone on T-Mobile? I’m glad they’re offering but I’m sticking with Android. Loving my GS3 and can’t wait to see what the GS4 or next Nexus devices will be like. Agreed. As long as Google keeps selling unlocked Nexus phones at ridiculous prices, I can’t justify the switch to iOS, especially given how good Android has gotten since Jelly Bean. In my opinion you had two very bad phones. The MyTouch and G2X aren’t what you call smooth phones. Now if you had a G2, GS2, GS3 or GN II then I would be surprised. I have to agree with you regarding the MyTouch and G2X, two of the worst phone ever!!!! HTC is just horrible when it comes to updates. I go the Galaxy S3 and Samsung has actually done a great job of releasing updates for this phone. If you want updates right when they come out, then you always want to buy a Nexus phone and use it on T-Mobile or AT&T (a GSM carrier). Verizon is the absolute worst carrier for updates, they even managed to screw up their Nexus update schedule. You might be able to find a Galaxy S, but it would be a used device. Since it is the older model, updates on it might be kind of iffy it this point. The only reason I did not get the new Nexus is because it is an LG phone. If you are not on a hurry, I would wait until the next Nexus device is launched. You never know, maybe another manufacturer might surprise us and release a stock phone soon. Hope that helps. The Galaxy Nexus(Samsung Phone) isn’t available from Google anymore. You can still get them new some places ( I saw them for 385 on Amazon but through third parties) or off eBay, but they are pricey for used phones. I have the Galaxy Nexus and I love it, but a friend has the Nexus 4 and I’m switching to it after the holidays. I know its an LG phone, but it seemed pretty stable and worked really well when I got to play with it. That, plus you can buy it direct from Google and its only $349 seems like a better deal. I have the Nexus 4, and… it’s just wonderful. Thankfully Google is responsible for its innards, and LG had no input on its software; only hardware which they actually are good at. I also had the G2x before; physically it was lovely but the software was buggy and awful! I know the N4 is manufactured by LG but there really is a huge difference. I am amazed at it and very happy. I just got the Nexus 4 and I highly recommend it. You’ll end up with the most updates and with potential LTE use on the Nexus 4, over the Galaxy. Why get the Samsung Galaxy Nexus when the new LG Nexus 4 is almost the same price — maybe even cheaper than the GNEX on some online shops. You can still get the GNex but not through Play Store. You can get it through Amazon or Newegg. Granted, it’ll be more expensive than what Google was selling it through Play store. I’d just go with the Nexus 4 if I were you. I have a Galaxy S3 right now and absolutely love it. I’m also one of those people who really don’t care about updates. So if it comes, it comes. Also, Nexus S is not upgradable to 4.2. The Samsung Nexus does get the Updates just doesn’t do anything around changing the fact that it only runs on 3G. Umm, neither of those are necessarily HTC. But, I have to say I agree. Though an update on my note II would be nice. You are correct about those phones, but both were more low level phones in t6he grand scheme of things compared to now when there are some heavy weight phones that blow the doors off all of the medium/lightweight phones places like Wirefly try to throw at you for free..
It’s too bad you never tried a Nexus device. They get updates within a week of the announcement, in my experience. OR tried a Samsung Galaxy device. There’s a known history of issues with the G2X. The MyTouch, depending on the model, is still used. It’s the older ones that aren’t used now. If you decide to give it another shot, I recommend the Nexus series or the Samsung Galaxy series. Then again everything has it’s own issues, and not just Apple Maps. Any android phone that is not an unlocked nexus phone will lag in updates. Before you give up on android you could try a nexus. No lag on my HTC One S! Rock Solid phone! I recommend a HTC 8X windows phone. very stable OS, nice looking, decent size, one of the best screens, syncs wonderful with work email, safe, etc etc.. and I believe, it is better thant the nokia lumia 920. Android phones only rock for few months or til next update. yeah, so that makes two retards who chose the trick option. Saying “I’ll buy an iPad” in response to “Will you buy an iPhone” is plain stupid. I’m sure iOS is equally nice in many ways, but just have too much invested in Android to switch to iPhone. but… wouldn’t stop me from getting a wifi only iPad. Regardless if we are all ‘Android’ lovers, this is a love/hate relationship with this device. It will sell millions on T-Mobile, if I don’t prefer it (I own an iPhone 5). I still respect those that will use it as their primary device…I’m happy for the TMo Apple fans, rejoice. Your time has come..
It’ll be a good day for those who want one, and very good for T-Mobile, but absolutely not for me. The UI is way to dated/boring, played with one for 10 minutes had enough. I customize and change my device way too much. I’m saying no. There is a possibility I switch to Sprint next year and if I do I’ll probably go to iPhone because at least as of now they don’t have a Nexus 4. I love Nexus and will not go to Touch Wiz or Sense. David whats your vote? u mind if u share? You must be new here if you have to ask what David’s vote is. Ha, I’ve got both an iPhone and a Nexus sitting next to me. The Nexus 4 is a review unit, but I’ll be buying one as soon as they come back into stock. In the meantime, they can’t pry this review unit away from me. Thats good David, I just switch from sprint couple months ago and never look back, im getting one as soon as the day itll come out, although I have gn2 and gs3, I kinna mis that Iphone ever since it came out from att. Im hoping to stay with tmobile 4ever! Thanks! Because I have accounts across different carriers, I would probably get an iPhone on one of the carriers that offers LTE. If T-Mobile brings LTE by the time iPhones come with NFC capability, I will consider it. I won’t consider an iPhone on any carrier without NFC and I would prefer a larger screen. I’m thinking that this won’t occur before 2014/iPhone 6. This would be in addition to the Android phones that I carry. I’m not giving up Android for the foreseeable future. It still boils down to service, now even with HSPA+ it will take well over a year to implement LTE and wait out on the FCC over the buyout of MetroPCS which will takes months to either approve or disapprove. Look how long it’s taking AT&T or even Verizon to expand their LTE service, years people not months. If Blackberry 10 doesn’t impress, then yes i will get an iPhone on t-mo. Ha ha. I’m also waiting for the BB10. But if it doesn’t impress I’d have to go with the GN II I believe. That’s the beauty about choice. Love my Note 2 but I have a soft spot in my heart for BB. Had to leave them awhile ago due to the OS being so antiquated at the time. I’ll be getting the BB 10 so this may be the first time ever I actually keep 2 phones. I think I’ll be in front of you in line. I’m waiting for the new blackberry touch 5! Take my money now black people. this is good for those that want it and good for tmobile me i’m a tech person i would try just about anything but i already tried the iPhone and is not for me, now is the htc / Nokia turn to be tested, but i really don’t see my self moving away from android and the galaxy s products. I will be buying 3 as soon a s they are available so long as T-Mobile does’nt get a cheapo model. Apple is releasing a lower end model as well. I’ve owned Android , can’t handle the constant updates. I now own two HD7’s and the OS is great but the app department is weak. So i’m definitely going back to IOS as soon as all the dust settles and see what T-Mobile actually has to offer. May I ask a question about your post? What do you mean by Can’t handle the constant updates? Do you not want the device to be updated? Are you having issues with the updates? I ask because Apple does update their devices as well, once a year. They mean that there are so many android releases, that you are never up to date. DAH , if you would of read my statement correctly i said i OWNED Android before the HD7 phones. Already have a 4s on t-mobile, but it’s on edge. My guess is they just sell unlocked devices while they re-farm the 3g spectrum. I’d be shocked to see them get a phone with the proper bands for 3(4)g.
Since TMo refarmed the Atlanta area, my wife’s 4s shows “3G” all the time now. I can’t confirm if it’s doing HSPA “3G”, or HSPA+ “4G”, but she tells me it’s a damn sight better than the EDGE speeds she was getting. I voted the second option (No), although it’s not worded the way I’d say it. I’m not “in love” with Android. It’s just, by far, the best OS for my daily smartphone needs. If Google were to really screw up, I’d totally consider switching, but so far they have only kept improving and kept 2 steps ahead of the other options. While I love my phone, I have always wanted an iPhone. I would absolutely give it a shot, but if it turns out I despise it, I would have no problem switching back. I will be buying one, but not for me. I personally love my Android but my daughter prefers iOS. None of the above. The answer for just “No” is not a selectable choice. Don’t care who or what your brand loyalty is. Having the Choice is all that matters to me. Right. I won’t be buying an iPhone unless it changes drastically, but I am thrilled that T-Mobile is getting it, as it means a healthier company. absolutely agree! we all win in this deal really. +1 here as well. may I also add that the network must also be ready for primetime. Don’t announce that a market has been “modernized” when in fact it only covers about 25% of the area. I forget the exact number but T-Mo only says a city is live when something like 80% is covered. Hopefully some UMA (Wi-Fi calling). Choice/competition is what drives innovation. I don’t think I’ll ever be an iPhone user, but I might get an iPhone for a family member. Nexus 4 owner…but its a win win for both company and consumers. I’m happy to see this happen. Im going to get one just because I can soon. Though I love my note 2 like its my babby. Doesn’t surprise me. I’ve seen many T-mo employees with iPhones. Could not agree more. I too have a Note 2 and an Unlocked 4S but the customer thing is my biggest win. Not me, I am very happy with both my SGS3 with 32gb of int memory and the just added Note 2. Between them both I am just thrilled. IMO Samsung has spent big money and time on innovation. The software on these phones are just sick. I find something new every day. The I-Phone is not for me, I find it a very boring device with a screen too small. They are at least 2 years behind Samsung and will never catch up. Thank You Samsung and T-Mobile. Maybe for my wife. Not for me really. The phone is very nice, no doubt, even-though tech-wise is not up to the competition. I really dislike the iOS ecosystem. I am more of drag-n-drop using any tool, and Spotify a lot. I do not need iTunes. I do not want iTunes. It iSucks. You wish that was the truth. It’s hard not to be part of the cool crowd, huh? Switched from Verizon to T-Mobile when the G1 was released. I’m not turning my back on Android any time soon. You could have switched back when the Droid 1 came out. You would have been on LTE, but who am I to say if I don’t know you. & he would’ve been crippled with bloatware & bloated with crippleware not to mention Motorola’s sketchy quality. Not a chance in hell. We’ll all pay for it however. Say goodbye to our lower etf, and data speed. Signing a contract should be done with the intent of fulfilling it, not worrying about a higher ETF should you choose to break it. Combined with 100% Value plans (new customers), and higher ETF’s perhaps it will lower the rate of people trying to scam T-Mobile and find loopholes all for the sake of a new phone they resell later. I don’t play the ebay game, but I don’t fault those that do. The carriers started this scam of two-year contracts in exchange for a “lower” price on the handset. Even though T-Mobile is trying to change the game somewhat with Value plans, it’s still a game. I actually applaud the customers that turn the game right back on the carriers. Scam? Was a gun held to your head when you got your phone and AGREED to the terms? Maybe you should take responsibility for the fact that you wanted a nice device. There are PLENTY of free or VERY low cost phones you could have picked from. If you want to try to make it personal, read some of my other posts first. I use the prepaid and EMP options, so I don’t sign contracts with T-Mobile. I take full responsibility for getting the phones that I want, including paying the full price for them. Most scams don’t involve guns, knives or other threats to life. Those are called robberies. Let’s not bite off our nose to spite our face because it isn’t the carrier that gets hurt by the “game”. It’s the customers that don’t play the “game” that get hit with higher prices. You can refer to it as a “game” all you want. No one is holding a gun to anyone’s head to sign a 2 year contract. There are so many other options out there that don’t require contracts. True, no one is using deadly force against the customers to get them to sign contracts. However, customers tend to rely on the information presented by the sales rep and the sales reps push contracts mostly. Especially in the case of T-Mobile, where a new customer can only sign a contract if he/she wants postpaid service. Carriers are hurt by any customer that doesn’t fulfill the contract and doesn’t pay the ETF. If the account is sent to collections, the carrier gets a reduced amount from anything that is collected if standard collections agency practices are followed. I’m happy it’s coming to help stop the churn, but I love Android. I am more excited for the network refarm and coming LTE. I’m looking forward to using an unlocked HTC One X from AT&T. I’ve owned two iPhones so I know first hand there is nothing special about them. My Android can do more than I did with the iPhone jailbroken. But frankly, I likely won’t be a T-Mobile customer by the time the iPhone gets there. I’ll be going where I can get decent coverage for my business travels. Will I rush out if the iphone 5 is offered? no way. I have been using Android since the Mytouch 3G – I started on 1.5. That being said, if the iphone 6 next fall is a significant upgrade, i would be foolish not to look at it and consider it. I’m definitely waiting for my BB10 on Tmo. No iPhone for me. Then I’ll have no problem buying one that day!!! ain’t buying no crapple $h1t, EVER ! Might give BB10 a try. Yeah with a 42mbps radio I will buy one. I also wouldn’t mind a LTE iPhone 5 if its not a battery killer. I’m excited man. T-Mo iPhone with 42 and LTE, that would be tight! I started out with T-Mobile/Voicestream too (on & off). started with the V100 2way phone and a Sidekick color as a young teen. Its too late. To me the iPhone has reached its peak in appeal and “innovation”. I like their app selection but I left that behind when I had a jailbroken iPhone 3G running on T-Mobile with Edge for data. Uggg. That sucked big time but since then, went through a BB and now my past 3 phones have been Android. There’s not much left for me to consider getting an iPhone at this point and to be locked into the restrictions that still exists. Went from a Galaxy Nexus to lovely my Galaxy Note 2, now who would honestly go from a Note 2 to an iPhone? Maybe for the apps but thats slowly becoming irrelevant. Just got my wife a Galaxy Note II and myself a Galaxy S III. There’s no way either of us would consider an iPhone. By the time we’re eligible for upgrades, the LTE implementation should be well enough along that there will be a strong reason to want to upgrade, but I am certain that these phones will keep us more than happy for the next twenty months. get rid of itunes synching for music and also provide a bigger screen then maybe i’d go iphone. I am unable to get over swipe text. I can only considering moving to apple if they support it. I like Android since the G1 and also like Tmo. I’d consider an Iphone if they have a design I like when it comes time for a new phone. I’m not a fan of the new model with it’s longer screen but not much widening. It feels like I’m holding a tv remote in my hand that will snap in half. It would have to depend on what Tmo has to offer at the time of my purchase. Figured the android vote would be up. This is still a good move for the T. Turn the boat as fast as possible. Bad leadership did really hurt the company and a potential relationship between apple and T mobile. Now where is a better Motorola Relationship…. I would be all over an iphone. To seal the deal T-Mobile needs to get an iphone that supports native 3G bands (not the reframe). Why? This goes goes back to Davids article regarding markets that still do not have 3G let alone the recent reframe. I really hope the price of the iPhone 5 can at least come down a bit, when T-Mobile launches it. Good step in the right direction. I can finally have the best of both worlds. Nexus + iPhone. Good stuff!! I would, if only to try something different. I’ve been on Android for a while, but all the good phones have giant screens, which is annoying. As long as Google keeps the unlocked Nexus phones between $300 and $450 I will continue to buy Nexus Phones but I guess even if it was $600 I still cant see my self moving to IOS after being on android for so long and using so many google services. What can I say Google they got me just like Microsoft got me as a kid when they donated 100 computers to my school in the early 90’s I was hooked on windows. I’ll pass on the iPh., â™¥’n my Note 2!!! I’ll pass on the I.P.H.! I think having the choice is more important. People who love android wont go to apple but if given the option on the network they like then who knows some might try it out. I think its a good thing for tmobile. And no im not an apple fanboy. I dont believe the hype. I read the numbers and i make choice that way. Im galaxy s4 bound. Sorry i had to throw that in there. Just bought a unlocked iphone for someone though. I’m one of the None of the Aboves, as it is good and I don’t care if iPhone is in T-mobile now, as long TMO takes care of their customer. I voted yes, but only because I think my wife will want one. I am forever Nexus. 1200 people on froyo and loving it. I had a SGS2 on value plan and bought an iPhone 5 after the refarming of Minneapolis. My experience has been horrible. The refarming is a sham, calls keep dropping each time the connection goes from 3G to Edge. So if you the refarmed 1900 Mhz is the only frequency the iPhone will run on, I would strongly recommend people not to buy an iPhone to use on T-mobile’s network. That said, how do I feel having used many Blackberry phones and Android and now using an iPhone 5? Google blows away iOs when it comes to maps, integration of all your contacts, your on-line search on chrome and the Android device. Google’s voice mail does not integrate with iOs so you miss out on that. Good points of an iPhone? No one makes a phone in which the hardware and software integrate so well. There is no lag in the iOs. Control is back immediately one presses home button unlike the hang in SGS2. The noise cancellation for voice calls, the smart battery life, the faster Wi-Fi and in general a very smart phone with lots of features. I am still having buyers remorse from the lousy 3G network, and I will either cancel my T-mobile membership after 10+ years or switch back to a new SGS4 in spring. It will entirely depend on how T-mobile’s network refarming progresses. I do not think Apple should partner with T-mobile until it is able to upgrade its 3G coverage. The refarming goes “live” in cities once they are close to 75% completion. You just have to be patient as it is not finished yet. That said, I too enjoy different factors from both operating systems. FYI Google voicemail works flawlessly on iOS and so does Google Search and Chrome. I’d just use one already unlocked! I don’t need 3G from TMO for my iPhone. just calls and text good enough + wifi. Choice is wonderful. I can go to a Nexus 4 because i am heavily invested in google with all the apps i bought, or go with an iPhone 5 for a reliable os and larger hardrive option. Love/gate feeling because it takes longer to make a decision. Now the latest problem is that since my GSII has stabilized since tha factory reset, i can go without an update for a while now. However i know when it is time to upgrade, i sure will not upgrade to an android device that isn’t coming from the nexus line until this fragmentation can stop. I would buy 5 tomorrow if they worked on all five LTE bands. As much as I have been waiting for a fully function iPhone (ie; not edge). not much good if unabel to use date in Europe too. I just hope they have an iPhone 5T, the 2 USA and 3 Europe, like Verizon. Happy to have the option, but now that I’ve gone to Android I don’t want to get used to something new. Plus, I’d like to know if the Iphone will have WiFi calling like the Android does on TMo. Without that, no signal at my house, so no go. I really hope it’s an iPhone that supports the current AWS bands as the refarming is slow and only in very limited areas. It probably won’t be until late 2013 that T-Mobile has the majority of their current AWS HSPA+ areas refarmed. I love that people are just happy that it’s finally arrived, and are happy for a healthier company! I’m stoked for TMo to grow! I love Android OS and variety of phones it offers, but having a teenager and tween on my account I’m sure I’ll be purchasing a couple Iphones. I agree David, choice is what will keep churn down. I’ve remained on Tmobile for years waiting for the iPhone, so this is exciting for me, but lets not forget Tmobile still has work to do with other choices. I was very unhappy that I could not get either a Nokia 900 Windows phone nor an HTC One X. I love my One S, but I sure would have liked the choice. Where was the option for I’ve already brought my unlocked iPhone for T-Mobile? Well different strokes for different folks…i am ALL ANDROID but this is good for Tmo in general. Might get one for my lady but i think the iPhone is over rated..the fact is some ppl just love anything Apple. This will likely put a dent on Android sales on Tmo..but not enuf to deter Androids overall match to the top. I’m getting one for sure. Love Android GS3, an iPhone even with a 4″ screen is way too small. Apple and their high priced iPhone are done! I hate the “cutsey” framing of the question… I don’t hate or love or any of those sentiments… Being cute trivializes the valeu of this survey. No, I have no interest in buying an iphone. I am happy however that T-Mobile has found a way to offer them to those who want them without making the rest of us pay extra to cover those big subsidies that Apple has historically demanded. 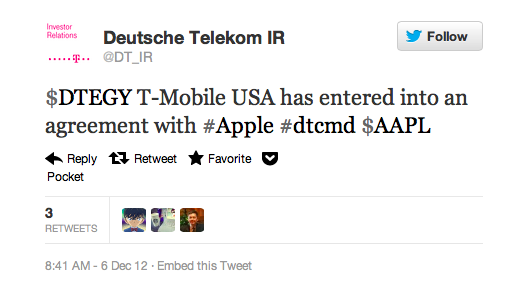 I dont see what the big deal is….those who want an iPhone on T-Mobile already have it. Along with new network improvements you get “4G”speeds. If this new device doesnt have LTE built in then I dont see why T-Mobile sought to get it. over 1 million consumers cant be stupid so clearly them subsidizing an iPhone is mute. O wait they are going value plan only etc blah blah I just dont want the HORDES of cheap people coming over with their iPhone crap messing up a good network well that said the network should know its limits instead of trying to make #$ hand over foot just focus on quality and hell carriers should have a limit on the # of people they allow on their network ..
You asked and now I’m gonna answer……….HELL NO!!!! Overpriced, for what you get in my opinion. I’ll definitely be getting one. I’m so damn sick of having a 2G/EDGE connection on my unlocked 4S. They need to launch it ASAP! A lot of your messed this thread up. A simple question was asked, would buy an iphone on tmobile. All that stuff about nexus, android system or it’s good for tmobile are irrelevant. I get it, some people just want to be heard. I already own an iPhone 5, but I am looking forward to switching to T-Mobile once again. having used an Android phone for the past 2 years, I’m ready to migrate to an iPhone. I’m a Mac user, and I find there are a lot of things I could do on Android, but still end up doing on my old iPod Touch because it’s just simpler for me. For T-Mobile, good to have more options. As seen here, others are now hooked on Android, so let’s make it the ” big tent”. Choice is good, if you’re the one giving the choice. It says a lot about the intelligence of those you’re giving the choice to. At 10%-ish market share and falling (for VERY good reason…), there is really nothing to be gained by selling iCrap. But it CAN help you pinpoint which of your customers are complete morons and then you can focus your price hikes against them. My girlfriend has been patiently waiting years! this would be a blessing as we’ve held out so long and honestly don’t want to switch to at&t. we love tmobile, jus waiting on that option!